A*STAR researchers have shown, through a supercomputer simulation, that high strength and shape memory can be realized at the same time by combining crystal grains of different sizes, a feat previously thought impossible. This finding demonstrates the potential of advanced simulations for tailoring materials to achieve previously unattainable physical properties. Shape memory alloys (SMAs) are materials that can revert to an original shape by heating after being deformed at low temperature—a property used in applications such as nanoscale switches and medical devices like stents and braces. However, shape memory alloys lose their functionality when the size of the constituent crystal grains goes below a certain limit—typically a few tens of nanometers. "A couple of theories have been proposed for why this is happening," says Jerry Quek from A*STAR's Institute of High Performance Computing. "We think that it is more difficult for the memory transformation to take place at the grain boundaries than within the grains themselves. This creates an additional surface between the transformed memory phase within the grain and the untransformed phase at the grain boundary, which eventually leads to suppression of the transformation altogether at very small grain sizes." This is important because SMAs, like most polycrystalline metals, become strong at very small grain sizes, where the memory effect is lost. While obtaining strength and memory at the same time in the same material seemed impossible, but if it was achieved, it could dramatically broaden the potential application and useful functionalities of SMAs. "We were motivated by some earlier studies that showed that the combination of two different grain sizes could result in an amalgamation of useful properties such as strength and ductility," says Quek. "However, the role of these types of microstructures in SMAs was unknown. A simulation approach is very efficient for investigating such optimization processes since a large set of simulations for different variations of grain microstructure can be studied systematically." Such simulations are not trivial, however, and come at a very high computational cost. Quek's team made extensive use of Singapore's National Supercomputing Centre, executing a code that laboriously simulated the change in energy related to the atomic structure within and around up to 3,000 crystal grains. The team then had to run hundreds of these simulations with different crystal size configurations to confirm the statistics. "We were primarily interested in the reversible austenite–martensite phase transformation," explains Quek. 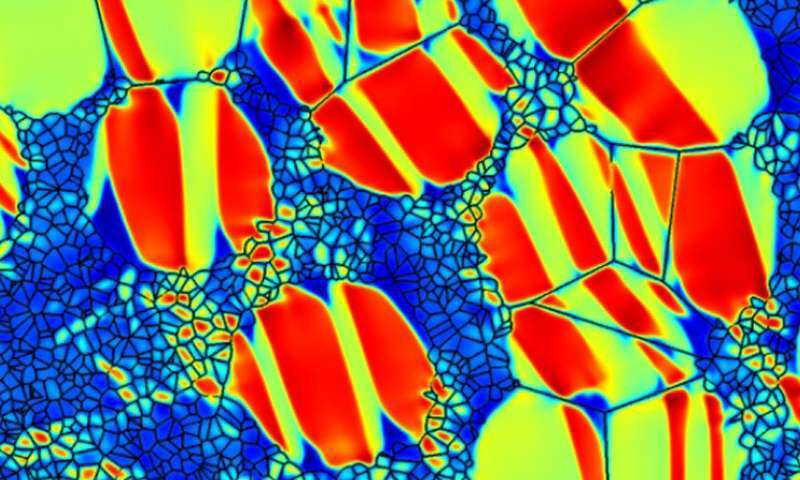 "The austenitic and martensitic phases have different atomic arrangements, and shape memory is possible if the material can be reversibly switched between the two phases, such as by changing temperature." To study this phase behavior, the team simulated and observed how the martensitic phase developed by quenching an initial iron–palladium alloy in the austenite state. By studying a wide range of grain size combinations, the researchers were able to show that the formation of the martensitic phase, and hence the appearance of shape memory, could be controlled by modifying the grain size distribution of the microstructure. "We found that introducing a population of larger grains amid nano-sized grains reintroduces the shape memory effect while retaining the high strength of the nanoscale structure, which could have applications in situations where both strength and shape memory effect are important," says Quek. "We also showed that for a certain combination of grain sizes, we can obtain a microstructure in which one region undergoes phase transformation to martensite while other regions remain austenitic, which offers the possibility of designing materials with a varying degree of shape memory functionality across a material."